Daily Prompt: Burning Down the House. Living in Australia, where we have the extremes of weather and climate, bushfires are a part of many peoples experiences. 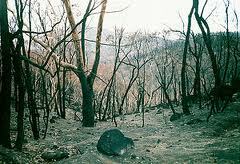 I grew up in an area that was bushfire prone. We experienced many major bushfires that burnt down homes and sadly took lives of those that were fighting them or were not able to be safe. This was the first bushfire I experienced it occurred during early December, which in itself is odd as it is mainly mid summer that the most critical bushfires occur. I was 9 years and it was a school day so I was at our local primary school, my two brothers were at the local high school that was 15 kms away.